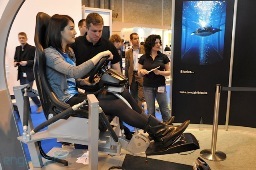 According to my source, the Festo AirMotion Ride Simulator is designed to simulate what it feels like to drive a fancy car, like a Ferrari or Lamborghini. However, look at the picture in front of this lady behind the wheel. Does that look like a fancy sports car to you? No, it looks more like a bongo submarine from Star Wars: The Phantom Menace. Of course, that could always be a part of some other exhibit, and it isn’t wise to get information from a picture. However, I checked out the source of my source, and discovered that the AirMotion Rid driving simulator is also a flight simulator. I can’t find any information about it simulating a sub ride, but it has polymer tubes capable of lifting the seat with 1,500 Newtons of force. In other words, I don’t see why you couldn’t use this guy for simulating some sort of unusual vehicle. It even has a 5.1 surround sound system so both sound and sight are simulated here. All in all, that adds up to one of the fanciest simulators for car, airplane, or whatever that I have ever seen. I’m sure that all of this is pretty expensive, but you’re probably not planning on buying one of these for the rec room, are you?